n Kevin Costner’s 1989 movie Field of Dreams, where great baseball players of the past gathered to play on a converted cornfield in the Midwest, Costner’s character Ray Kinsella was asked by various players, “Is this place Heaven?” His now-famous reply to them was always a deadpan “No, it’s Iowa.” It may not have been Charlie Trotter’s objective to create Heaven in his eponymous Midwestern restaurant, but at Trotter’s 20th anniversary dinner on October 5th in Chicago, he invited some of the world’s most celebrated chefs to create a culinary "field of dreams". The lineup alone was enough to coax a shudder of excitement out of the most jaded dining enthusiast. To have Ferran Adria fly in from Spain and cook for you may alone have been worth the price of admission, but as the late-night commercial says, that’s not all - there was much, much more. All it took was a quick glance at the evening’s menu to realize that Trotter has some influential globe-trotting chef buddies, each of whom traveled to Chicago to contribute a singularly spectacular dish to this memorable evening. 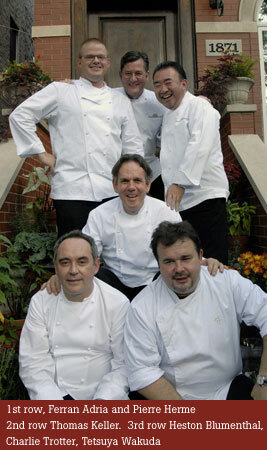 Joining Trotter in the kitchen were Adria, Tetsuya Wakuda from Australia, Thomas Keller and David Myers from California, Heston Blumenthal from the U.K., Pierre Herme from France, and Daniel Boulud from New York. 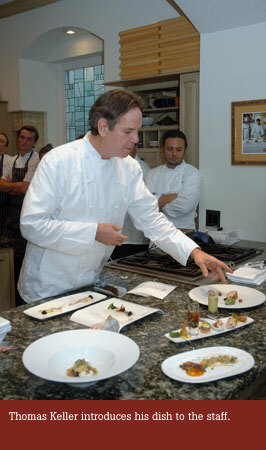 Thomas Keller told me that he had cooked at various events with many of the evening’s star guest chefs, but never with all of them together at the same time. Ninety lucky guests had gladly paid $5,000 each for a single 10-course meal prepared by these chefs, with the money earmarked for Trotter’s Culinary Education Foundation charity. This, it would seem, was the true impetus for the event, but in speaking with each chef, it was clear their motivation was friendship and camaraderie, pure and simple. During the day, the chefs arrived with their own personal brigades, and twice as many service personnel as were probably needed for the event clogged the narrow hallways of the turn-of-the-century converted townhouse. I secretly wondered if there would be enough room for everyone once service began. Fortunately, Trotter has a second kitchen that he uses for television taping, staff training, and large events. 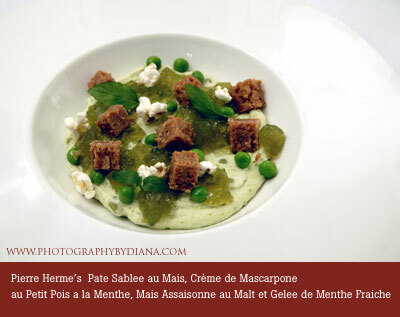 Yet, even with that extra space, the complexity of the menu held the promise of an interesting evening. On Chef Trotter, whom he met 10 years ago at a cancer benefit, he says “It is like a very good marriage; you do not have to see each other that often, but you love each other so much.” On his dish, he described it as “pure oysters, topped with ham and caviar on the side. You really have to enjoy the taste of the sea.” The dish was balanced by two pistachio spheres, made with an oyster sauce and finished in an ordinary microwave oven. Tetsuya Wakuda may not be a household name here in the United States, but his eponymous restaurant on Kent Street in Sydney is near the top of every list that dares to select the best restaurants in the world. His French-Japanese inspired menu is filled with Australian delicacies and his cuisine routinely inspires chefs around the world. 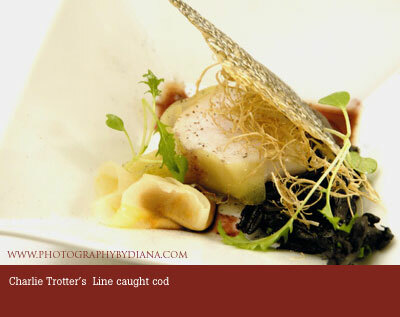 His dish was arguably the tastiest and most flavorful on the evening’s menu. 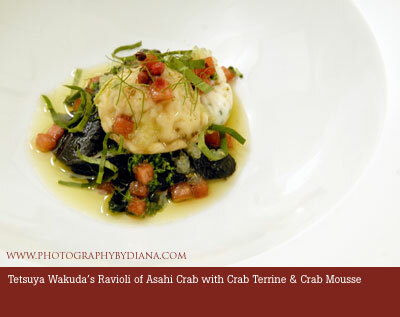 Tetsuya first met Trotter in Sydney, so he decided to incorporate a little bit of Australia into his dish, Ravioli of Asahi crab. In addition to the delicate chunks of Asahi crabmeat, the dish was also surrounded by crab terrine and crab mousse, but Tetsuya described the ingredient that made the dish special. “Finger lime is a little citrus that we can get in Australia, and the inside it is just like caviar. It has a nice kick when you taste it,” he explained excitedly. 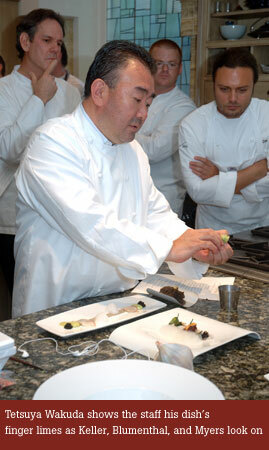 The finger limes required a prep chef to spend hours meticulously removing the tiny seeds from each small fruit, creating the small amount of citrus caviar that Tetsuya required for each plate. 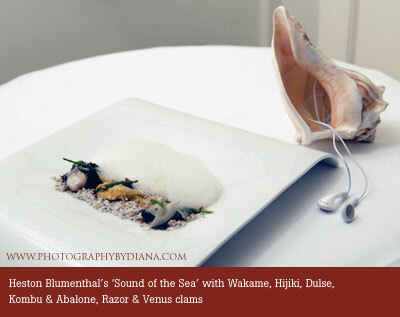 “Your memory of a seaside will be different from others,” said Blumenthal. “If you see a painting of a seaside, it is not actually your memory, it’s somebody else’s picture you’re looking at. But the sound of the sea is the sound of the sea, and the sound of the seagull is the sound of the seagull. 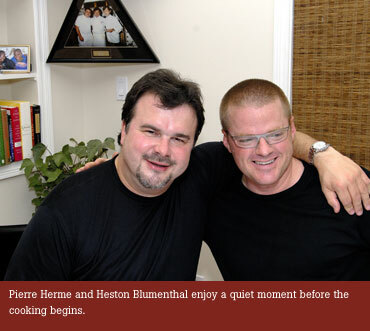 So it’s about trying to make the sounds vague enough to create the framework that you can paint your own picture in.” Although it made perfect sense to hear Blumenthal explain it, I could see the fear in the eyes of Trotter’s waiters as they realized they would be the ones explaining this to their guests in the dining room. During Daniel Boulud’s introduction to the staff, he claimed that whenever there is a great party, Tetsuya is the man to have around. 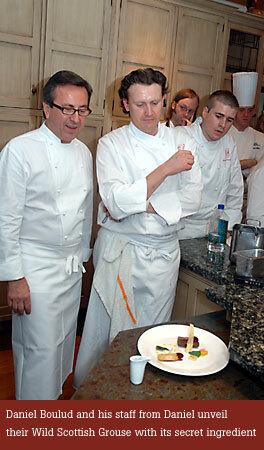 But most restaurant people here in New York know that Daniel is usually the life of any chef party. 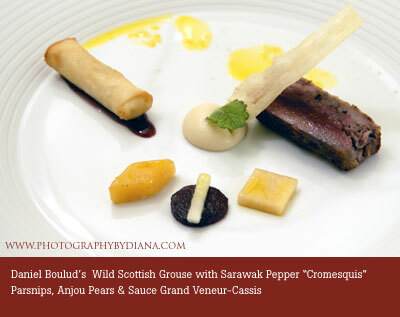 Flying in directly from Paris to Chicago, Boulud brought his sense of humor, two sous chefs from Daniel restaurant, and his own French “secret ingredient.” He introduced the Wild Scottish Grouse he would be preparing that evening, saying that the dish came with “a sauce that contains…well we won’t call it fois gras, we’ll call it fancy duck liver.” The entire room erupted in laughter, including Trotter who exclaimed “You can do what you want here, don’t let me stop you!” Trotter, who has not allowed fois gras to be served in his restaurant for several years and has taken a lot of heat for his personal stance, allowed Daniel to bypass his regulation for this one evening. I did wonder how Boulud managed to smuggle in his “fancy duck liver” past Chicago’s Homeland Security officials at O’Hare. The dish, by the way, was delicious. A brief cocktail party, where the chefs were asked to mingle with the evening’s high-paying customers, was the final calm before the perfect storm. 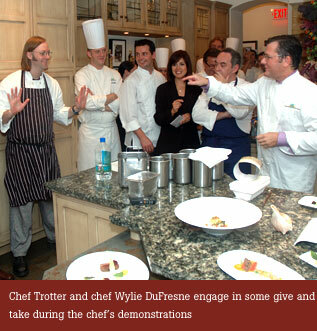 Once service began and dishes were being prepared in Trotter’s restaurant kitchen and the larger television kitchen, the chefs turned in their party hats for toques, and the atmosphere quickly turned serious. The TV kitchen, being the roomiest of the facility, attracted the most chefs, so I stayed there as long as I could. I managed to dodge flying cooks and panting Trotter’s waiters, most times hugging the wall like a 20 year old at a packed nightclub. 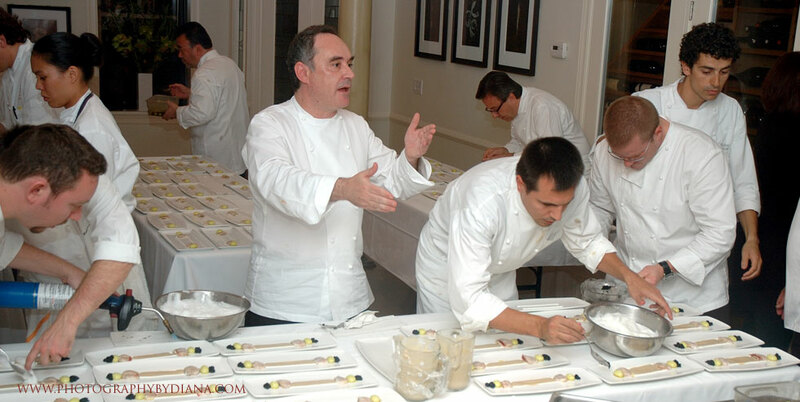 At one point I watched Ferran Adria and his team plating his dishes, while Boulud, Blumenthal, and Tetsuya were behind him, working alongside long tables where dozens of dishes were being painstakingly assembled. If this field of dreams were a baseball diamond, you could possibly compare it to watching Ruth hitting into a Wagner to Hornsby to Gehrig double play. But like all extravagant parties, this one had its share of snafus. There were perhaps too many chefs and very likely too many service staff – many who showed up were ex-employees who came back on this one night to help out – and certainly everything didn’t run smoothly. One of Adria’s sous chefs let the stress get to him and upset some people with his temper, in marked contrast to his boss whose booming voice and arm gesticulations defied the calm that defined his face throughout the evening. By the time the crazed sous chef brought us Adria’s dish to photograph, it had flattened to the point where we could not photograph it, never mind eat it. It was a shame, for it was a beauty. But besides Trotter’s charity and the celebration of an American restaurant that has influenced so many other great chefs throughout its twenty years, this night was about friends coming together to celebrate. 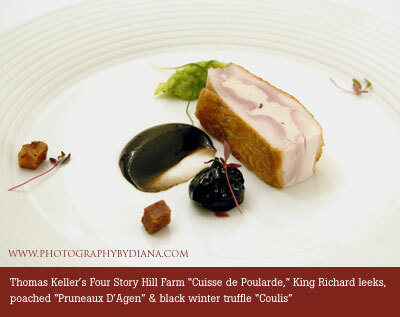 Thomas Keller probably said it best. “For me cooking is all about that sharing, and we’re sharing a great experience here together,” he said.